The candle on your cake will be the number 3 today. You have been reminding me daily that you will blow out a 3 candle on your "birfday." Last night as we discussed your birthday candle you said, "And I make a wish. I will wish for a doggie!" Oh the current doggie obsession you have! Everything you talk about has to do with dogs. You have numerous toy dogs: stuffed, small figures, books about dogs, doggie puzzles and the list goes on and on. Your favorite TV show is "Paw Patrol." After all, it is about dogs "saving the day" as you like to say. If someone needs help, you will often be heard saying, "It's ok! I will save the day!" You have brought new life to our family. You are excited by each new thing you see. You live life with contagious amounts of joy. Christmas was thrilling for you as each aspect was being newly discovered. The Christmas lights on houses, each ornament on the tree, picking out your new ornament, learning Christmas songs, making list for Santa and learning that Jesus was born to "save us." You loved it all. Your addition to our family has been such a blessing. You bring so much joy to our house. Nothing slips by you. You know exactly what everyone is doing and spend a large amount of your time trying to become involved as well. You love spending time following Jacob, recently the two of you began playing tag and interactin more. It warms this Mommy's heart. The innocence and purity of your conversations are refreshing. Last night you insisted on helping me make the bed. As you tried to lift blankets to the bed you said, "I can do it! I am a strong boy." Of course you succeeded. You then cheered for me once the bed was fully made saying, "Mommy, you did it! You are so strong, mommy!" Not only are you our cheerleader, you are our love bug as well. You give the best hugs, wrapping your arms fully around the person's neck and hugging tightly! When you are sleepy you like to cuddle, saying "hold me, Mommy!" You always make sure to tell others that you love them. You even have a "girlfriend" at daycare who you hold hands with any opportunity you find. I pray daily that you continue to love life to the fullest. I pray you will always hold such a joyous attitude about life, that you will see the positive in every situation. I pray you will bring the happiness to others that you have brought to us. Happy 3rd Birthday, Sweet Baby! How are you already 8 years old? I am impressed with the tall, mature looking boy you have become this year. Your 4'7" frame is deceiving. You look older than your 8 years. This year you have faced and overcome many challenges and have learned how to persevere and adapt. You have taught me how to be a better mother this year. You have shown me that no matter how busy life gets, spending one on one time with you and your brother will always be my priority. You continue to be such a blessing to our lives. Your genuine passion for your interests make me smile. You are definitely a zealot like your mother. I enjoy listening to you announce the "WWF legends" as you stand on the fireplace as if you are on a stage. You are beyond excited for the newest WWE 2014 video game being released in a few weeks. I never know what song you will be singing, but I can guarantee it is most likely a Michael Jackson hit. You have more lyrics memorized at 8 then I will ever have in all of my years. Perhaps my absolute favorite thing about you is the joyous expression and excitement that comes on your face when you talk about your birthday. Every year since your 2nd birthday you get so happy as your birthday nears. Earlier this week when I told you it was October you squealed. I hope you will continue to love celebrating your birthday each year. When I start to feel sorry for myself, and I hate to admit it happens more often than not, I look at you. Every single day you venture into a world that is overwhelming. You overcome challenges on a daily basis the rest of us don't understand. Despite these daily obstacles you reach any goal you set your mind to. Jacob, I love you to the moon and back. I am committed to be the best mother I can be for you. I promise I will always support you and walk beside you (hopefully you will still let me hold your hand). It is January 11, 2013 and today you turn two years old. The minute you took your first breath, you have changed our lives. The loud scream you made filled the room as you made your presence known. From that second forward you have continued to make sure everyone knows you are in the room. You have the friendliest personality and you own every room you enter. You carry yourself with such confidence I know that you will do anything you put your mind to. I love how you seem to be the “Norm” (Cheers reference) of your daycare. As soon as you enter the room a chorus of “Lucas!” sounds from the teachers. You are proud to show off the toy you snuck in or the character on your shirt that day. You greet the other children with “Mornin’ Kids” and you make sure to tell everyone “Bye!” before leaving every day. Perhaps my favorite cuteness you exhibit is when you do “roll call” as you announce everyone in the room. You also like to talk about your friends at daycare and list all their names, always beginning with the girls’ names. You are quite the ladies’ man. I find your desire to help so endearing. You like to help with the laundry by pulling everything out of the dryer. You will clean up your toys, but we know you are still just a two year old as you enjoy dumping all the toys as well. You love to be praised and feel like you are helping. You will hand Jacob his toys even if he doesn’t want them and hand out tissues to everyone in the room. You want everyone to be happy and worry if someone appears not to be. Mickey Mouse Clubhouse is definitely your favorite TV show and toys to play with. We all have the theme song stuck in our heads most every day. You will carry around your Mickey Mouse toys and make sure we tell you their names. You enjoy Elmo as well, but Mickey has surpassed the Sesame Street gang, hence the theme for your birthday party being Mickey Mouse and friends! I pray you will always be as happy and joyful as you are at two years old. I hope your compassion and caring nature will never be suppressed. I desire to be the mother you need to help you grow into the great leader and man I know you will be one day. Your future is so bright; I can’t wait to see what is to come for you. We love you to the moon and back, Little Man. Happy Birthday! Today is your 7th Birthday! I loved your grin when we woke you up this morning singing "Happy Birthday." Your eyes were still closed and you were not ready to get out of bed yet, but you could not surpress the smile on your lips. The joy that you have about your birthday fills my heart. Every year I can't wait for the days surrounding your birthday. You love the extra attention and the celebrations just to honor you. So much so I wish we could celebrate your birthday every week. I can't believe you are 7 (I think I say this every year!). You have grown so much this year, literally. You are over 70 pounds and 4 ft. 5inches. Actually, you are probably 4'6" at this point. You are going to be towering over me in just a few years. Your red hair is just as red as your first birthday (maybe even more so). I am so glad that God decided to make you stand out in that way. Your red hair and glasses set you apart from others. Since your last birthday you have completed your first year of school. Kindergarten was a new adventure for both of us. You are a very smart boy, testing in the 96th percentile in reading. Even though there are numerous hurdles you have to jump, I know that you will succeed. You are no longer just tolerating your little brother, but you are interacting and showing him love. Earlier this week your Daddy relayed this story to me and it warmed my heart. Lucas was going around giving his nightly goodnight hugs. He stopped at Dad and gave hugs and kisses, then he went to you. You leaned over and give a slight hug (patted his back) to Lucas then stood back up. Lucas was wanting to give you a kiss as well and you realized this. You picked Lucas up, brought him up to your face and allowed him to give you a kiss. You then sat him back down just as gently. Lucas was beyond thrilled with this contact with you. He did a little dance and looked at you with admiration only a little brother can show toward his big brother. I feel so blessed to be the mother to both of you and I know you will both bless each other's life in insurmountable ways. Your love of music has only continued to grow through this year. Your current favorite artist is Michael Jackson. I am certain you will be thrilled to open the Michael Jackson Experience video game at your birthday party tomorrow. You also enjoy play the Just Dance video games and love to sing along to Katy Perry songs and "Call Me Maybe." You seem to find it hilarious when I know the words to the songs and sing along since I am not the music guru that you and your daddy are. Jacob, you are an amazing blessing to our lives. You have taught me more life lessons in your short 7 years than I have learned in my entire 32 years of life. I know there is a lot to accomplish in the years to come and it may not always be easy, but together we will make it! We love you, Bubba! Happy Birthday! I can't believe a year has passed since we heard your first cry. What a fast year it has been! You have gone from a 9lb 1oz baby to a toddling 26lb 7oz little boy. You still love your paci and haven't yet given up the bottle, but you are growing into a smart little boy. You are such a huge blessing to our family! Your sweet smile and demeanor are contagious. You are so curious and are always trying to get everything in your hands. You adore your big brother and try to do anything he does. You love to dance or your version of dancing, bouncing up and down! You love to play pat-a-cake. I can just say the word and you immediately begin to clap your hands. You love to play with cars and balls. If you can crawl after something you love it. However, I venture to say that pots and pans are your favorite toys. Needless to say you are always on the move. You like to climb up the stairs, but will wait on the 4th step until we come behind you because you want us to "chase" you. When we come to the stairs, you grin from ear to ear and begin to climb the steps as quickly as you can while looking to see if we are following you. I once heard that you can measure the amount someone is loved/liked by the number of nicknames they have. If that is true, you are a very loved little boy, "Lukie Loo," "Lucky Luke," "Lucas Mucas" (as Daddy so affectionately calls you), "Bubba," and more recently, "L. Reed." You are my baby boy and always will be. I am so excited to see what the next year brings and I am thrilled to be your Mommy. Happy 1st Birthday, Lucas Reed! Today you turn 6. Wow! I can't believe that little (or not so little) baby with the red hair is now so tall and handsome. But it is true, you are growing up quickly. This year has been a very eventful year for you. 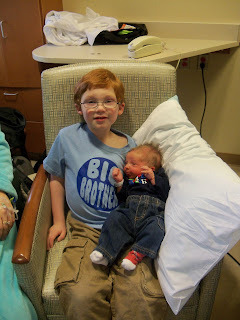 You became a big brother in January! Lucas has been a blessing in our lives and even though I'm not sure you acknowledge it now, he is a big blessing in your life. He loves watching his brother play and I'm sure in a couple more months he will be trying to play with you. You participated on your first sports team. You showed an interest in soccer when we watched your cousin play last fall and I knew when the spring season came around we needed to register you. Although, your enthusiasm lessened when you realized there were rules and you couldn't wander off the field or pick at the grass, you stuck it out and I am proud of you! You started Kindergarten! I had a lot of worry about how you would transition to Kindergarten from pre-school, but you were marvelous! You were very excited when we first visited the school to register, but as we approached the building I recall you asking me if I was leaving you there. I felt your excitment and your trepidation as if it was my own. I know it is difficult for you to make changes in your routine and I am thrilled that you have made this change so well. I'm in love with your laugh and your pure joy. This past Saturday you woke up on the "silly" side of the bed (at 5:30a.m. -- could you please sleep a little later, especially on the weekends? Please? Is it too much to ask?). You laughed and squealed and found everything hilarious! From calling your cousin the wrong name to a cartoon you had seen numerous times before -- life was just funny to you. Thank you for making me a Mommy and for being such a blessing in our lives. Even if I may not remember that at 5:30 in the morning! Today, I've been inspired to get out of my blogging silence by Kelly Korner's Show Us Your Life topic. Today's topic is Special Needs Families. I have touched on it slightly off and on over the years; however, late last year we received an official diagnosis of Autism for Hoss. We are facing this with our heads up. Luckily for Hoss, my job profession has given me knowledge about Autism and I am familiar with resources and supports available in my area. However, the fear of the unknown is the biggest worry. I strive to find and listen to more experienced parents and what has worked for them as their children have faced obstacles and challenges. Hopefully I will find more through this post! Below is a post I wrote about Hoss in September 2010, before the official diagnosis. He still melts my heart! He turns five in a couple weeks. He is a cuddler, loves to have big bear hugs and sleep snuggled up close to someone. His red hair and blue eyes positioned behind adorable oval framed glasses make him an instant charmer. He is very tall for his 5 years and all his teachers talk about how much he grew over the summer. Just glancing at him, he is a typical boy with bruises on his legs from climbing, dirt under his fingernails from digging and a superhero action figure in his hand. He sings along with the music on the radio and has very specific preferences in what music he likes. However, “typical” is not a word textbooks would use to describe him. Instead, textbooks would likely describe him as autistic. See, this little boy does not make eye contact, he seldom initiates conversation, he mumbles and sings to himself and he can not name any friends. Well, except for his best friend, his mommy. That’s right. He tells everyone his best friend is “Mommy.” This makes his mommy’s heart melt every time he says it and recently that has been daily. Being his mommy is an extremely difficult task. Mommies have dreams for their children, hopes for a better life. This little boy’s mommy has recently realized these dreams will be much more difficult for her little boy to accomplish. While, his mommy still believes he can do great and marvelous things, it pains her to see him struggle daily to try. Despite these struggles, this little boy is perfect in his mommy’s eyes. I know because he’s my little boy.